On the 25th October 2018, a group of 11 young people (and one dog!) from Queen Alexandra College attended an Arts Award Discover Day run by the OHMI Trust. 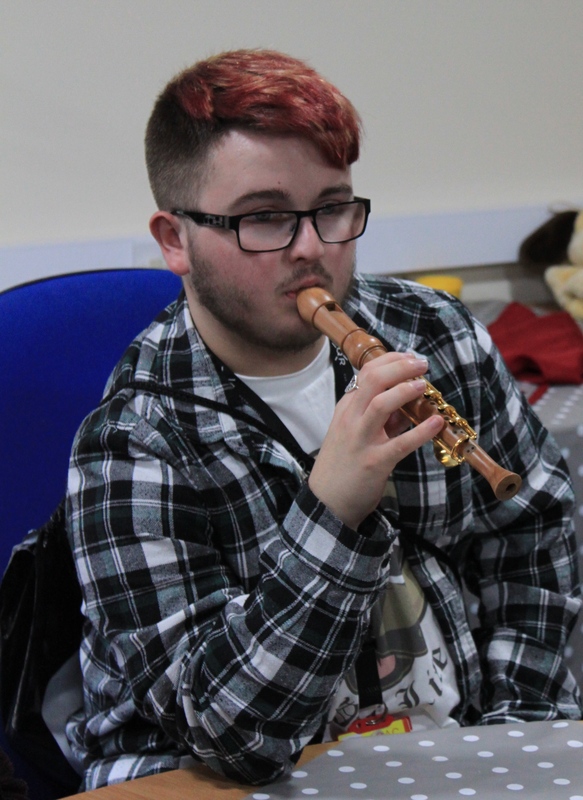 The day aimed to broaden the young people’s experience of the arts by giving them the opportunity to have a go at playing a number of different adapted musical instruments. All the young people in the group had a visual impairment along with other additional needs, but in no way did this hamper anyone taking part or having loads of fun during the day! We began by sharing the young people’s previous experiences of the arts, and also finding out about arts they’d not heard of and opportunities available to them. The group really enjoyed finding out about radio plays and listening to The Archers! 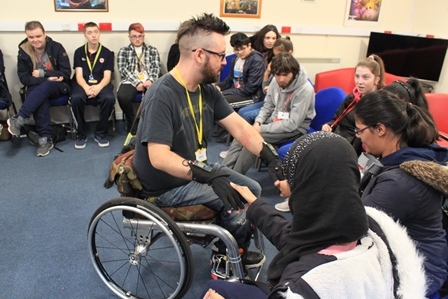 After a quick break, the group was treated to a visit from Kris Halpin, a professional musician with Cerebral Palsy who performs using MiMu gloves. The young people prepared and asked him lots of questions to do with his life as a musician, particularly in relation to his disability, got to see him perform (amazing! ), and even got to try on the MiMu gloves themselves. Kris had a fantastic open approach with the young people, and it is safe to say he left everyone feeling very inspired after his visit. 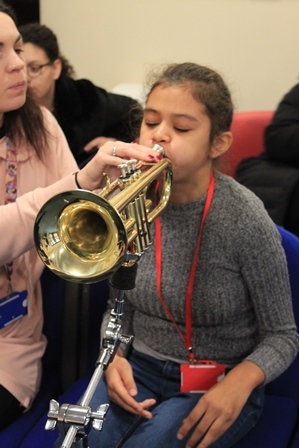 The afternoon was spent in smaller groups trying out instruments including one-handed recorders (meaning you could potentially read braille with the other) and very noisy trumpets on OHMI trumpet stands so that they were also one-handed and stayed put! In the final session of the day, the young people shared their experiences of trying the instruments, and the day as a whole with the rest of the group. They then created and recorded their own short, radio-style interview show, with one young person taking the role of the host, asking the others (in small groups for each topic) their thoughts on each part of the day. This was a really lovely opportunity for everyone in the group to voice their ideas, and also create something that could then be shared with other students, friends and tutors as a record of the day. Throughout the day, the group was supported by a number of staff from Queen Alexander College, by Rachel Wolffsohn and Tim Low from the OHMI Trust, and led by Arts Award Advisor Liz Wrighton. All 11 students successfully completed their Discover Arts Award, and were very excited to receive their braille certificates from Trinity College.